The city wants your expired and unused drugs. Don’t flush them down the drain — our wastewater system doesn’t filter out medication, so flushing “can cause a wide range of problems for wildlife, from changes in behavior to birth defects to developmental abnormalities. 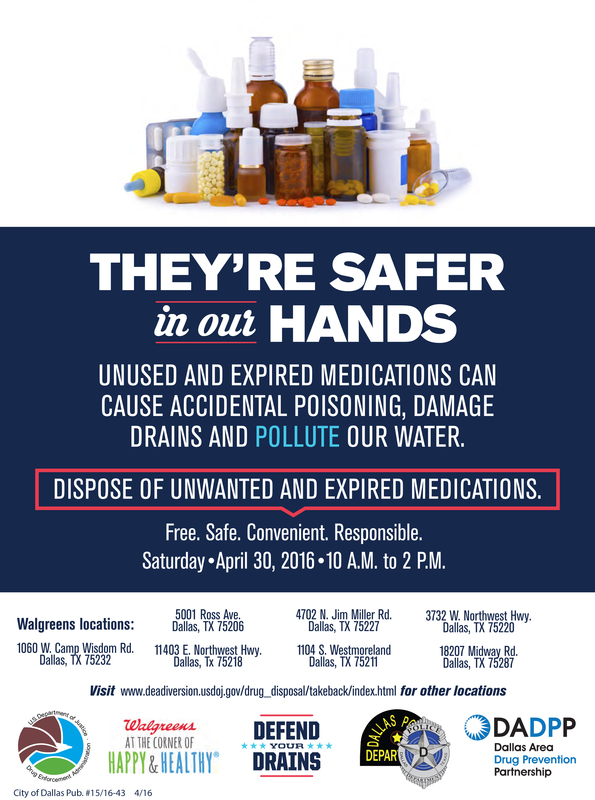 So this Saturday, April 30, from 10 a.m.-2 p.m., you can dump your drugs at participating Walgreens stores (the closest ones to our neighborhood are 5001 Ross and 11403 Northwest Highway) that are partnering with Green Dallas, Defend Your Drains, the U.S. Department of Justice, the Dallas Police and the Dallas Area Drug Prevention Partnership. Turns out it benefits drains, wildlife, law enforcement and a host of others for you to open your cabinets and do a drug purge. It benefits you, too, if you’re at all interested in disposing of prescription, over-the-counter and even your pet’s drugs responsibly. We’ve looked into it in the past, and disposing of drugs requires a drive to a Lewisville because so few pharmacies take them. So save yourself some drive time while saving the environment and donate your drugs tomorrow.